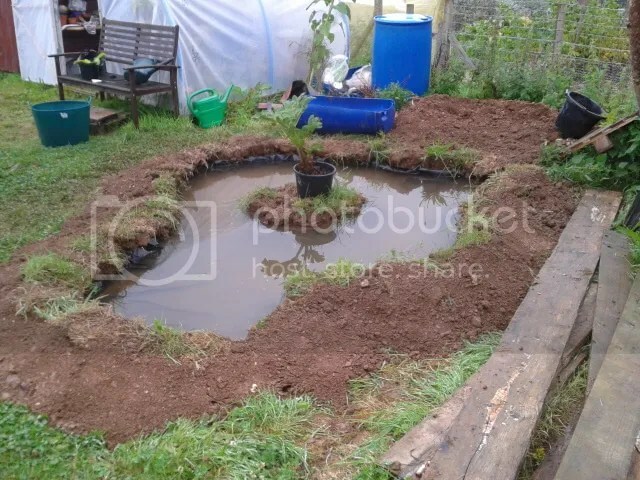 As I posted before we gave up on the idea of a puddled clay pond as it was too much work on a piece of land we don’t own plus I got a surplus pond liner so we thought sod it let’s just get it done. I filled the pond to a height so that the water level is just goes over the island in the centre. I placed a Gunnera on the island and then surrounded the pot with sods of earth removed when digging the hole. I built up the sides with earth from the hole and then covered the edges of the liner with sods and bermed earth. This will all become a lot more natural looking once vegetation has re established itself again. I noticed there was a water boatman in there this morning. How thee hell did that get there? There are a couple of shallow areas that I am going to use for aquatic plants plus I may put some fish in there and then pump the water through a couple of growbeds to keep the water fresh. Categories: Gardening, Wombling | Tags: Gunnera, pond, pond liner, water boatman | Permalink.